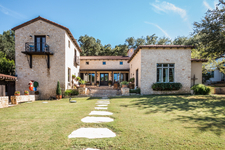 A timeless Tuscan Farmhouse with artfully combined contemporary sensibility and the Tuscan vernacular this home at 10910 River Terrace Circle in Austin, Texas rests in a quiet neighborhood near the shores of Lake Austin. 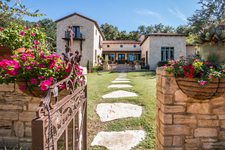 Featuring vaulted ceilings, stained concrete floors, wood beams, Italian roof tiles, open and airy living room with stone fireplace, and Italian style open country kitchen all the elements are reminiscent of an old Italian villa in a modern home. Even the front exterior surrounded by a low stone wall reflects the style of a typical farmhouse courtyard anchored by the 2 story tower. A striking feature of this house is the long living area that stretches the full length of the house anchored by the kitchen at one end and the large stone fireplace at the other. With interiors that are warm and inviting, not dressy and fussy, this unique home has many antique elements which lend a sense of patina. 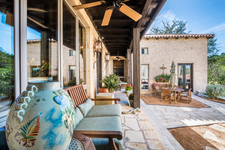 The great room is annexed to a screened porch which leads to an outdoor patio with fireplace and plenty of space for al fresco dining. Beautifully designed for indoor/outdoor living the grounds offer a plethora of comfortable and inviting places to lounge and enjoy the stunning views.Although the kitchen has all the modern features expected, such as stainless appliances and sub-zero refrigerators, it gives a nod to the Tuscan farmhouse hearth with open shelving, farmhouse sink, thick concrete countertops, arched opening, stone walls and terra cotta tiles on the backsplash. The home offers an exquisite master retreat plus four bedrooms (two en suite), a billiards/game room, family room, office loft and third small living area that could function as another office, exercise area or sitting room. In addition to all the special qualities and amenities incorporated into the home itself there is also a private boat dock with one boat slip and a party deck on top with a portion screened in for year round comfort. All of this just a short golf cart ride away. 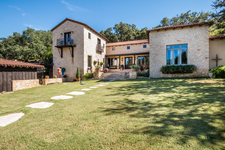 It truly is a slice of Italian Paradise in Austin, Texas.